Many things inspire songwriters, last week I wrote about Walk Away Renee of which the writer, Michael Brown was inspired by another name song which was Michelle by The Beatles. This week it’s a similar story which is Tom Jones’ 1968 hit Delilah also being inspired by another girl named song. The music for Delilah was written by Les Reed and the lyrics by Barry Mason who once explained in an interview with the International Songwriters Association’s Songwriter magazine how he was inspired, “Normally, it would be a line, especially a title line that would be the inspiration for me. For Delilah, I was inspired by Jezebel, the old Frankie Laine hit. I used to love story songs when I was a kid. Delilah is the one song Tom never leaves out of his live sets. He probably wouldn’t be allowed to, as it is such a karaoke favourite all over the world. It was also the title of Tom’s sixth UK chart album and his first chart topper. The other memorable event for Tom that year was it was the first time he had a pair of knickers thrown at him which was at the Copacabana Club in New York. During a particularly hot set, someone threw a table napkin at him, but the sweat kept pouring off him, so a woman hoisted her skirt up, whipped her draws off and thung them at an astonished Jones who mopped his brow with them. For years, it was a mystery as to who Delilah actually was, but in an interview, Barry Mason explained; “The song was written about a teenage girl called Delia I met on holiday in Wales when I was about fourteen. It was a whirlwind holiday romance, but I never got the girl out of my mind. I wanted to write a song about her for years, but why why why Delia just didn’t work. Then one day it just hit me, I changed the name to Delilah and after that it just fell into place”. When Tom debuted the song on The Ed Sullivan Show in America in 1968 he was asked to change a line, ‘At break of day as that man drove away I was waiting’ because it indicated that the ‘man’ he had seen in the window with his girlfriend had stayed overnight with her, something taboo for the conservative Sullivan Show producers. 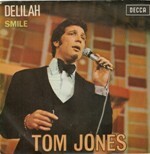 Tom remarked in interviews that he questioned why the producers were upset about a random lyric indicating the Delilah character’s partner in infidelity had stayed overnight when the entire song is about infidelity, stalking, and murder but to no avail so he changed the lyric to get the much needed TV exposure. When Tom reached runner up position in the UK it was an incredible week for girl’s names with five in the top ten. They were The Beatles’ Lady Madonna at number one, Cinderella Rockafella by Esther & Abi Ofarim at four, Rosie by Don Partridge at seven and Donovan’s Jennifer Juniper at nine. Delilah has also been recorded by Connie Francis, Ray Conniff, Jerry Lee Lewis, The Platters and The Ventures, but the only other charting version was that of the The Sensational Alex Harvey Band who also reached the top 10 in 1975. It is also a favourite chant by Stoke City football supporters at their ground. The story goes that the song was chosen when a group of Stoke City fans were having an alcohol-infused sing-song in a pub. When police officers asked them not to sing any songs with swear words, Delilah came on the jukebox and they adopted the song from then on.